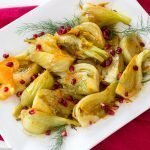 Braised Fennel in Orange Sauce with Pomegranate Seeds is a beautiful and delicious way to add healthy root vegetables and fruit to your menu. 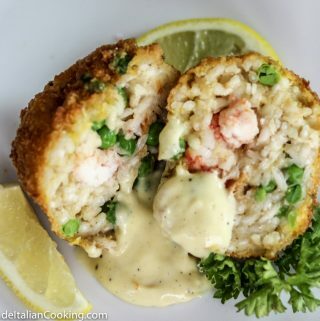 It is easy and fast to prepare, and is a great side side for fish or pork. 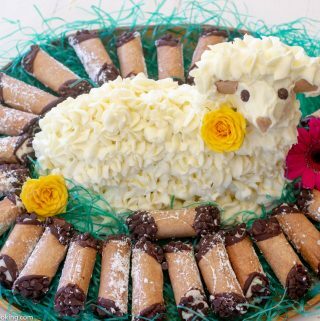 The beautiful colors are festive and add an elegant touch for a special meal. 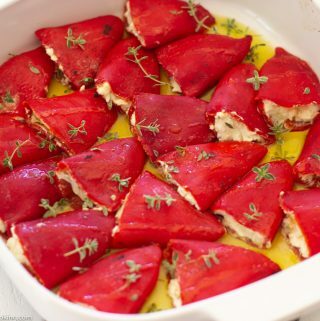 The pomegranate seeds are key for this dish, not only for their ruby red color, but the sweet pop of juice with each bite. 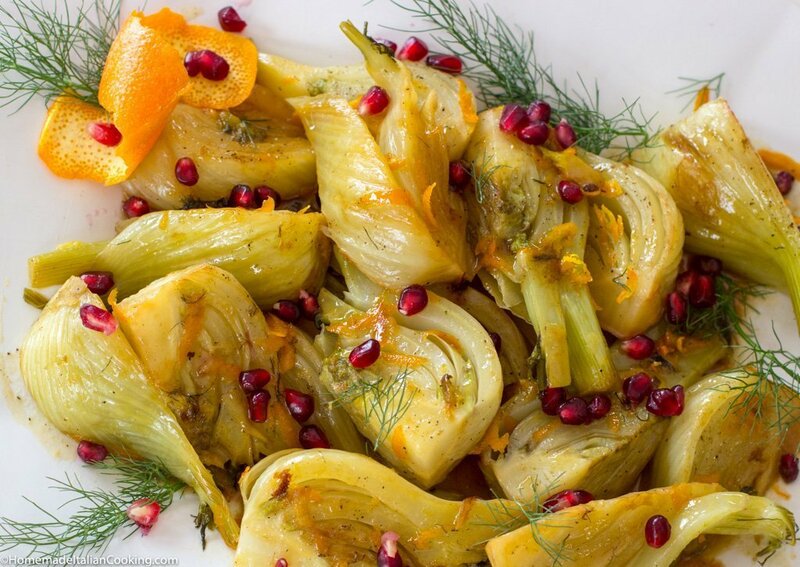 Fresh fennel is crunchy and slightly sweet with a subtle fragrance of licorice or anise. Fennel is a winter vegetable usually available from autumn through early spring. It is comprised of three parts; bulb, stalks and fronds (leaves). All parts can be eaten and used in cooking. 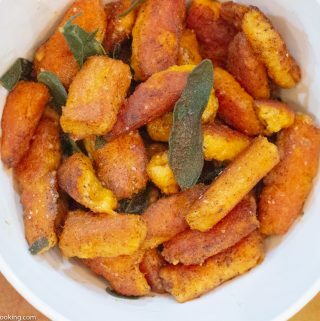 This recipe uses the bulb, cut in wedges, and fronds for garnish. 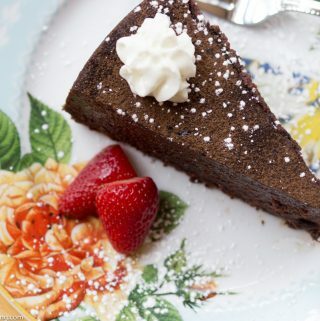 The enticing anise flavor pairs beautiful with bright citrus fruit and ripe, juicy pomegranate seeds. I also love fennel bulb sliced thin in Italian-inspired salads such as my Sicilian Blood Orange, Fennel, Red Onion and Mint Salad! 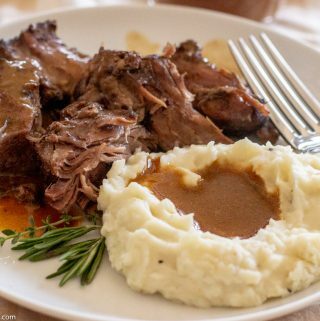 Braising is a simple combination-cooking technique of searing and moist simmering in a covered pan. 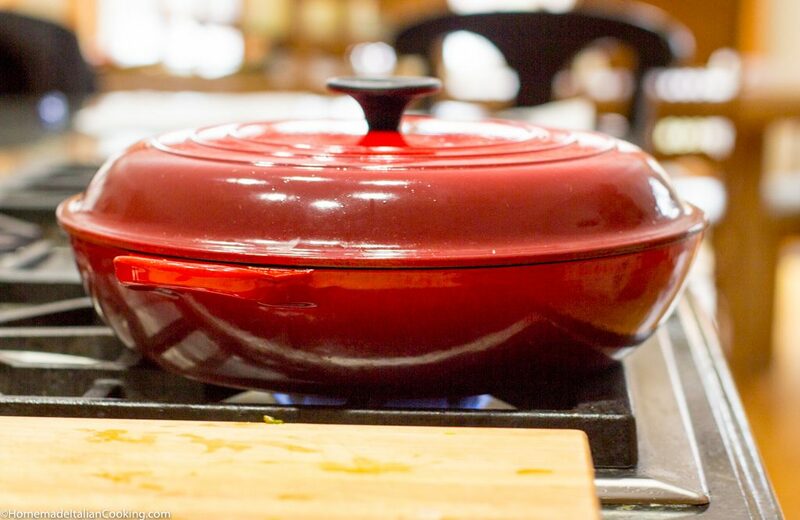 This cast iron, enameled Le Creuset Round Covered Braiser is my favorite pan for braising. 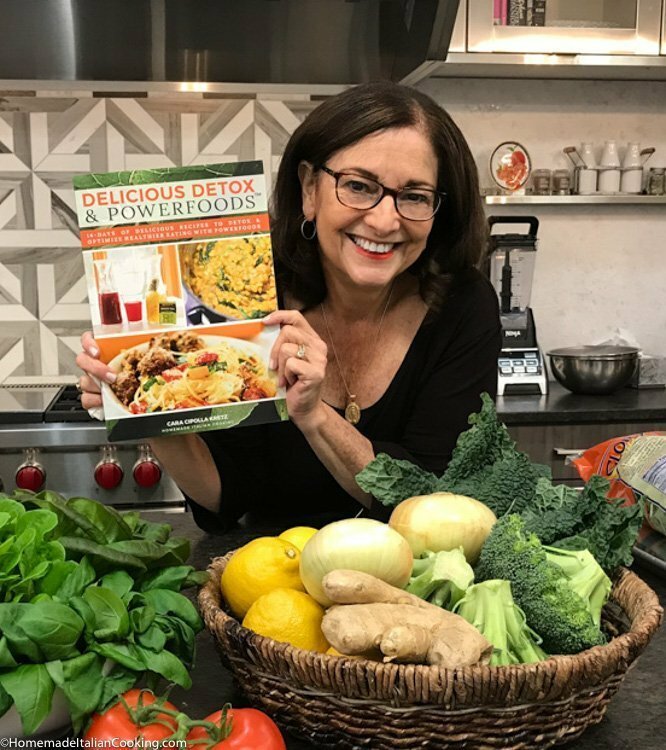 I can cook the food ingredient first in butter or olive oil on high to get a caramelized or sear effect, and then add a moderate amount of liquid and simmer, covered, to complete the cooking. Since you don’t need a lot of liquid for braising, a shallow casserole pan works well. This pan can go from searing on high, to a covered, low simmer on the stovetop or in the oven. It is also pretty enough to be a serving dish. The side handles make handling easy. 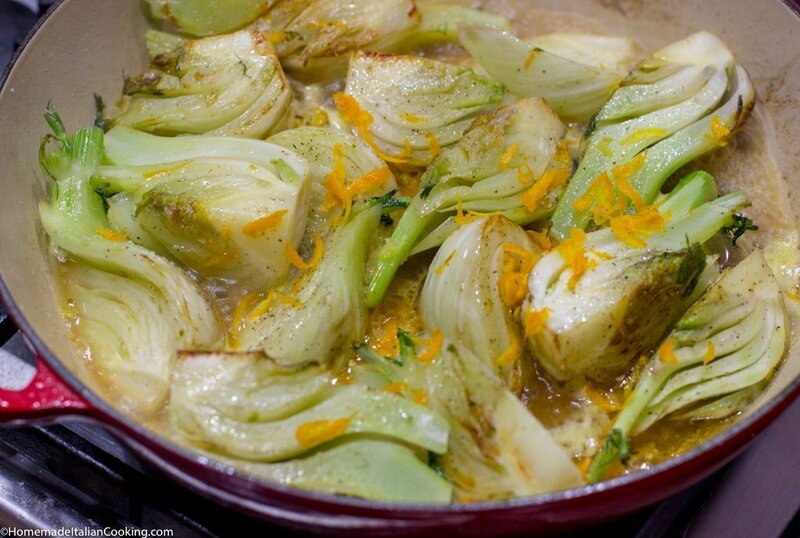 The steps to make Braised Fennel in Orange Sauce are easy. First, trim and cut the fennel bulb in wedges, being sure to keep the root end intact. This helps hold the fennel together during cooking. Save some of the beautiful fronds for garnish. Next step is to zest and juice one orange. You may need two oranges if one orange is not juicy enough. My favorite tool for zesting is a coarse grate microplane. It makes the job super easy and fast. 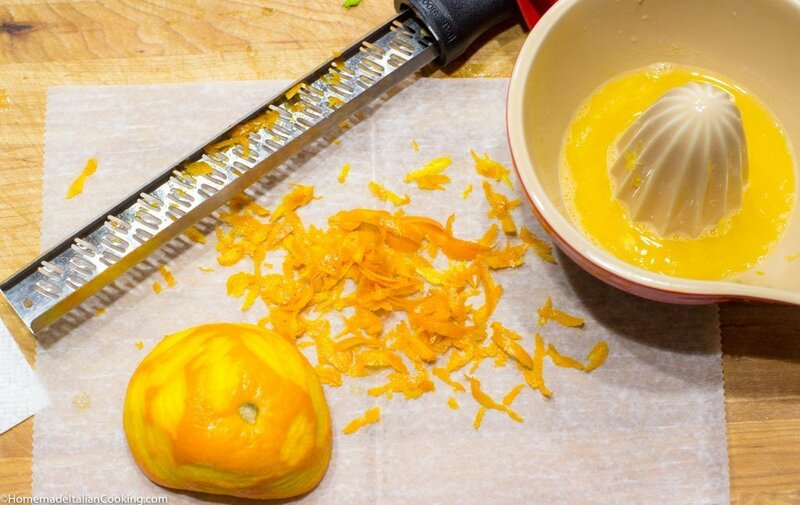 The zest is large enough to see in any dish for optimal flavor and color. You can also use the coarse crater for cheese. Next, place the fennel wedges in a single layer in the hot pan and caramelize on both sides. 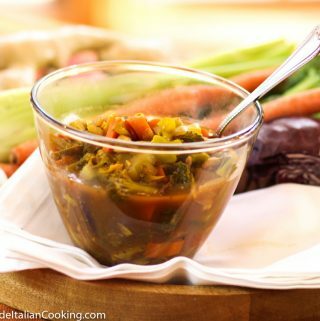 This steps adds flavor and color to the sauce. Add the orange juice, orange zest and chicken stock to the pan, cover, and let simmer on low until fork tender. Spoon the warm sauce over the cooked fennel and garnish with chopped fronds and pomegranate seeds. 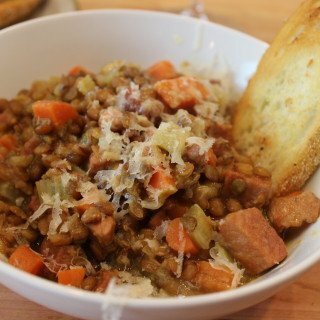 You can also use the same pan, and return the fennel to the pan and gently toss to coat. 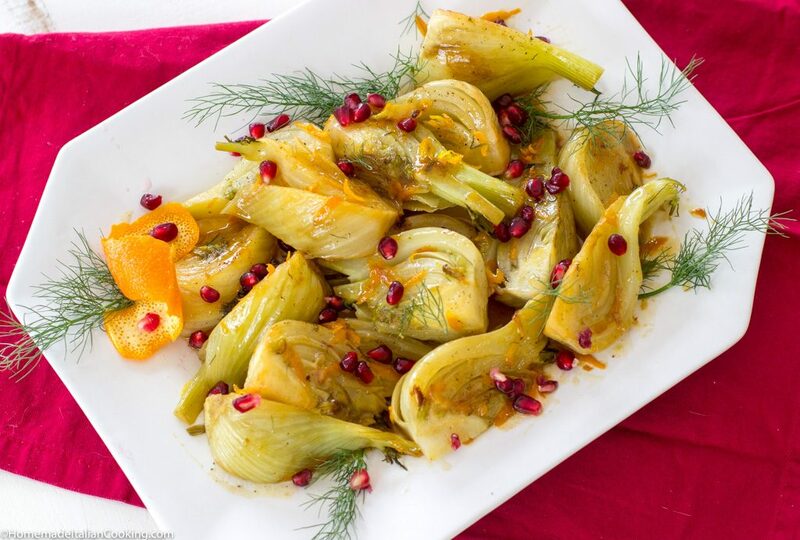 Braised Fennel in Orange Sauce with Pomegranate Seeds is a beautiful and fragrant way to add root vegetables and fruit to your menu. 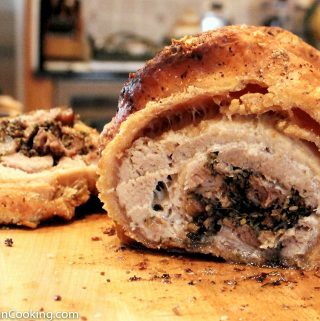 It is easy and fast to prepare, and is a great side side for fish or pork. 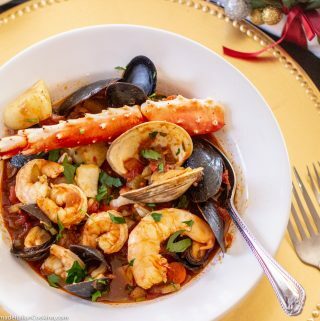 The beautiful colors are festive and adds an elegant touch for a special meal. 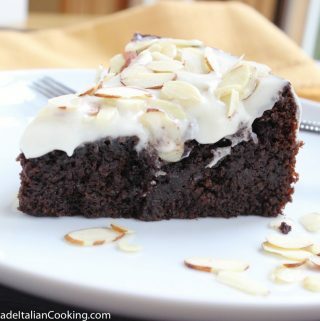 The pomegranate seeds are key for this dish not only for color, but the sweet pop of juice with each bite. 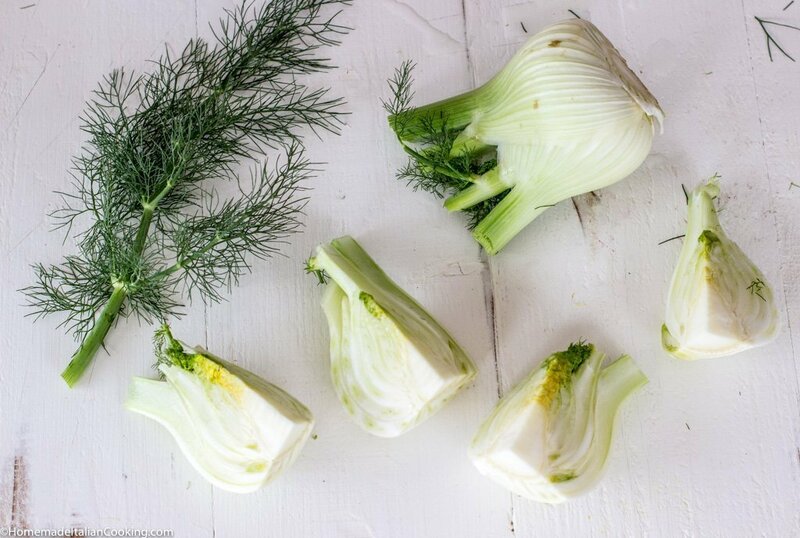 To prepare the fennel bulbs, cut the tops off the bulbs of fennel and reserve 2 stalks of fronds for garnish. Carefully slice any dark or bruised marks from the root end but keep the root intact. 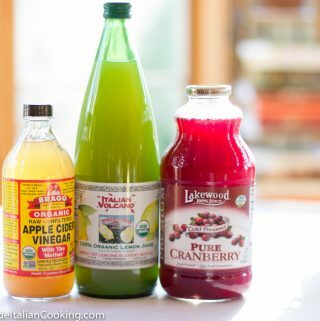 This will help keep the fennel wedges together during cooking. Cut the bulb in half from root to stem and then slice the halves into wedges. If the bulb is very large cut wedges into half again. Be sure to keep all wedges a similar size for even cooking. Heat the olive oil in large covered skillet on the stovetop over medium high heat. Place each fennel wedge in a single layer in the pan. Sprinkle with salt and pepper. Cook for 3 - 5 minutes on each side until they start to caramelize and turn golden brown. Add orange juice, orange zest, and chicken stock and bring to a boil. Cover and simmer for 10 - 15 minutes or until the just fork tender in the large root end. With a slotted spoon, transfer fennel from the pan to a serving platter. Add butter to skillet and allow the sauce to reduce for another 5 minutes or until slightly thickened, stirring occasionally. 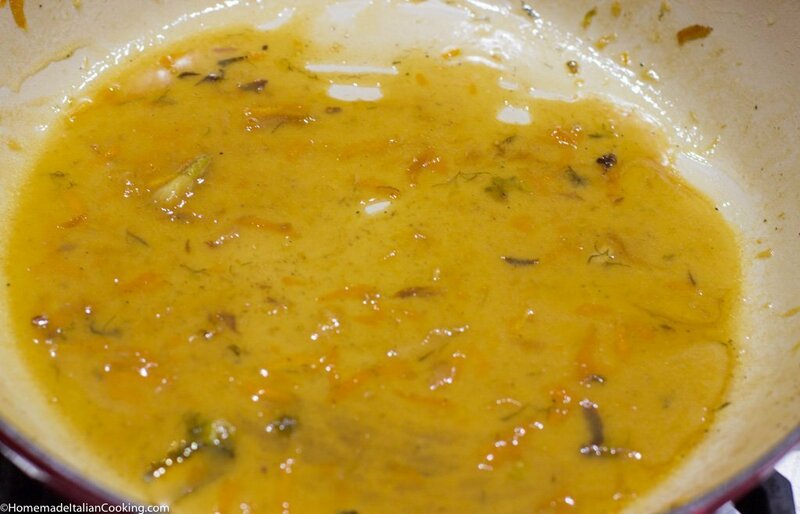 Spoon the warm orange sauce over the fennel. 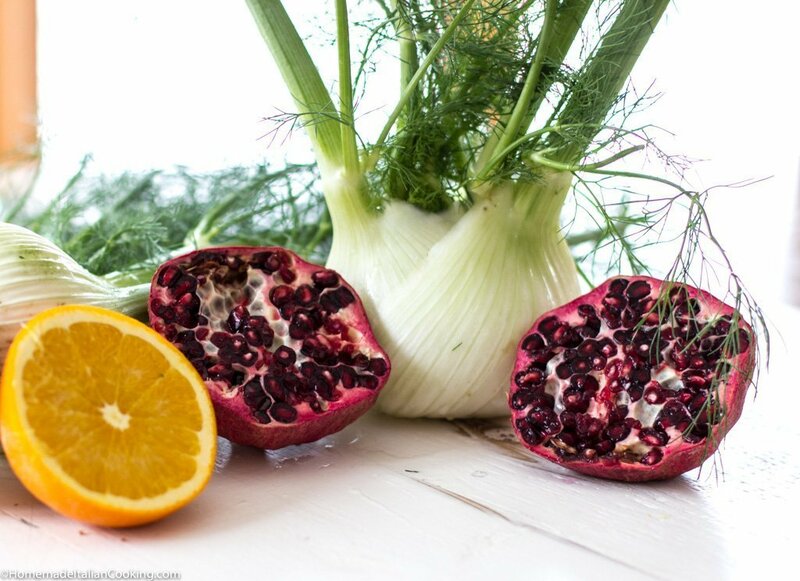 Garnish with fresh fennel fronds and pomegranate seeds. 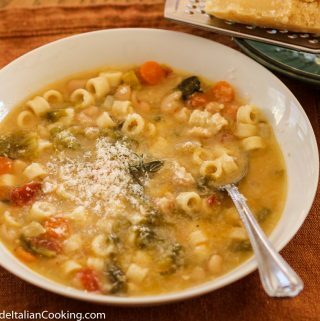 Can be served warm or room temperature.